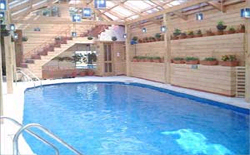 A boutique mountain resort, 22 km from Shimla, The Chalets, Naldehra offers accommodation in quaint pinewood log cottages. The Chalet hotel in Naldhera, set by a deodar forest and the 18 hole Naldera golf course is an offbeat retreat for the discerning traveller. 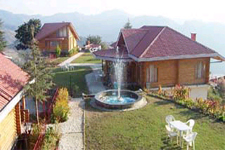 The Chalets is located in Naldehra near Simla, Himachal Pradesh, North India in the Himalayan mid hills and is an eight hour drive from Delhi. The Chalets at Naldehra, everybody's dream locale, gets its name from the spread out individual units of pinewood log homes or chalets. Each log cottage or chalet is quaint with a bedroom which opens into a living room with a working fireplace and extends into the dining room. Tea/coffee makers in the pantry area enhance the comfort. However the romance is completed only by the staircase winding up into a second bedroom with sloping roofs. 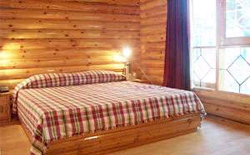 This room has thick floor mattresses suitable for children or accompanying adults. 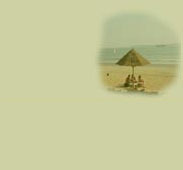 Each cottage is typically suitable for two adults and two children / extra persons. Individual balconies, a small lawn and an independent entrance gives it a feeling of a complete home. Honeymoon couples just love the romance of these cottages.